Mobile phone users do everything on their phones, including chatting, studying, and even shopping. Whatever your business is, you should pay full attention to this new group of target customers who are transitioning to using mobile devices rather than desktop computers for their social life. Note that some of these trends are from 2012, and may not be currently accurate. Smartphones are the future With the growth of mobile technology, more people will use their phones than computers to get online. 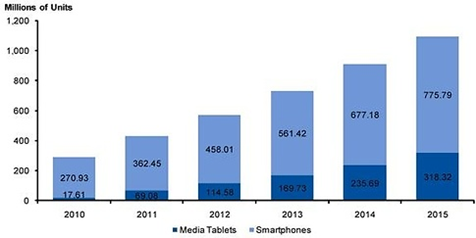 The number of mobile devices is set to more than double in the next years. This chart is from the Worldwide Smartphone and Media Tablet Shipments, 2010-2015: Estimated revenue from Google, eBay, and PayPal Google estimates to generate $7 per year from each smartphone and tablet. Google’s mobile ad revenues are expected to more than double from an estimated $2.5 billion in 2011 to $5.8 billion in 2012. eBay expects to sell $8 billion of merchandise (10% of all sales) in 2012 through mobile. PayPal expects to see $7 billion in mobile payment volume in 2012. Smartphone Users Buy Often According to Google Mobile Planet, 20% of smartphone users purchase on a daily basis, while 14% do so a weekly basis. 67% of wealthy smartphone users shop on their devices and 63% regularly buy products and services. Half of them make purchases at least monthly, with almost 80% spending more than $100 on mobile phone transactions in the past year, and 25% spending in excess of $1,000. Event tickets (39%), gift cards (29%), and food and electronics (both 27%) are the top purchase categories. 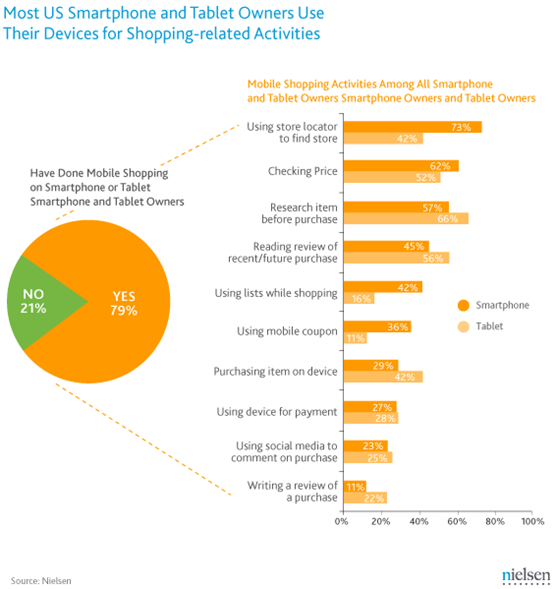 Tablet owners enjoy Online Shopping more Tablet owners enjoy shopping more than mobile users because of the bigger screen size. According to Adobe Digital Marketing Insights, tablet users spend over 50% more per purchase at online retailers when compared with smartphone visitors, and 20% more when compared with traditional laptop and desktop visitors. Tablet visitors are nearly three times more likely to purchase products and services online than smartphone visitors and were nearly as likely to purchase as desktop/laptop visitors. According to Localeze and 15miles, tablet owners are the most active local searchers with 64% using their devices at least weekly for local searches and 86% making a purchase from their most recent tablet-based local search. Smartphone and tablets users are quite similar in their behavior, but it’s not identical. Let’s check out the following facts: Smartphones are a Major Vehicle for Shopping Over 79% of smartphone consumers use their phones when they are shopping in store. What are they doing on those phones? Different Stores Mean Different Smartphone Shopping Behaviour This graph looks at some of the trends of smartphone shopping behaviour depending on which store the person in question is frequenting. Looking for a way to promote your business online? Why not take a look at Wishpond’s social media services?